The best "children's stories" are usually about something more than what they appear. For example Where the Wild Things Are is about children dealing with anger and emotions beyond their control. A Monster Calls is about children dealing with loss. Similarly, I Kill Giants is about a young woman struggling with her emotions around loss, around alienation, and powerlessness. Director Anders Walter has made a beautiful film which taps into childhood pain and loss in a powerful way. Writer Joe Kelly has adapted his story into a screenplay which is smart and simple, tapping into truly powerful truths. His cast, lead by the strong Madison Wolfe, brings this story to life so convincingly. Barbara's journey facing her "giants" is a truly lovely and inspiring story. But perhaps the best part of I Kill Giants is the way its story connects to the real life pain of its audience. "You mean I can't save her?" There are battles which can't be "won" at least not how they are won in stories and in the movies. 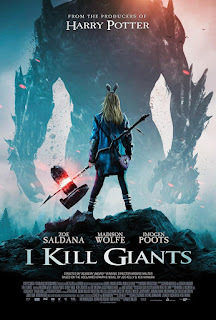 I Kill Giants' story brings us to a truly honest place, a place which is painful yet inspiring. And Barbara is a true hero.